A warning—once you try a real soap to shave with, you'll never use a commercial shaving cream again. You can tailor this recipe to suit your own oil preferences. It is not a whole lot different than a regular cold process soap recipe, although it has been adjusted to give the qualities needed for a shaving soap. 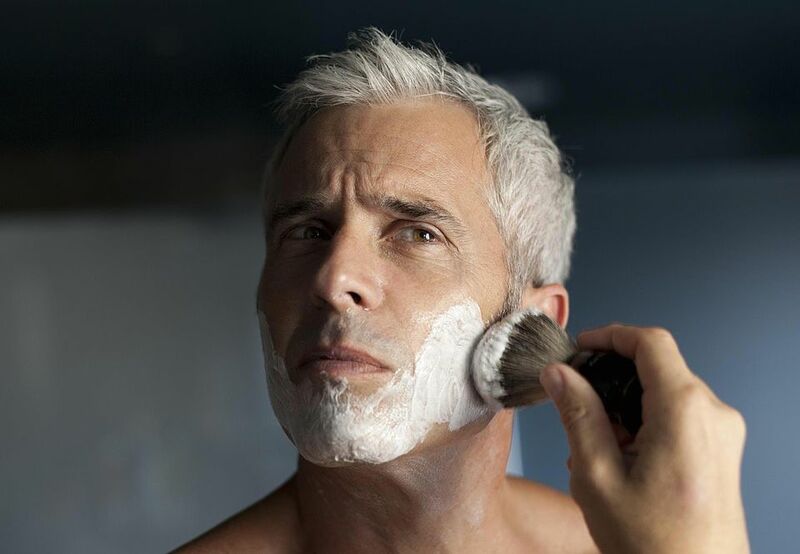 As Michael Ham recommends in his book " Leisureguy's Guide to Gourmet Shaving," a shaving soap should be abundant in lather, fragrant, lubricating, protective, and long-lasting. The clay helps give the soap extra "slip" and also works to purify your skin. (Think of a clay or mud mask.) The added castor helps give a thick creamy lather. All you need to do is grab a shaving brush. If you want to use a melt and pour base to make a shaving soap, you can, but your results will vary depending on the soap base you are using. To modify the recipe, just take your basic soap recipe and adjust your recipe so that it has more long lasting and lathering oils, and not as much olive oil. Animal oils like lard and tallow work well in shaving soaps as they have long-lasting, stable lathers. Use a combination of liquid oils like sunflower, canola, almost and/or oil. Using multiple oils contributes to the complexity of the lather. Add a fragrance or essential oil appropriate for the person shaving—but be sure that it is one suitable for sensitive skin. Remember, you're shaving through this soap. Make the soap like you would any other cold process soap recipe. You can add the clay pretty much any time you want in the recipe. Some people add it to their lye water. Others just mix it into the oils as they are melting. You can also take a half cup or so of your melted oils, put them in a measuring cup, a mix your clay into the oils. Then add this pre-mixed clay/oil mixture to the soap once you've reached trace. Any method works fine. Pour the soap directly into coffee mugs or tins. Another option is to pour it into lengths of 3-inch PVC pipe that has one end plugged up. This will give you a disc of soap that can be placed into a mug or tin. Let the soap cure as normal, and when it's done, enjoy a wonderfully old-fashioned, but terrific shaving soap.